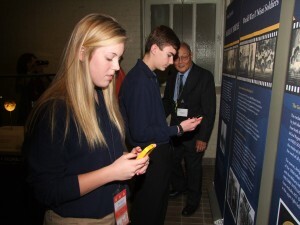 NEW ORLEANS — The Congressional Gold Medal awarded in 2011 to Nisei World War II veterans began its national tour over the weekend at the National World War II Museum, a Smithsonian affiliate, in New Orleans. The medal made its debut there during opening festivities for the new U.S. Freedom Pavilion: The Boeing Center on Jan. 12, and will remain on view through Feb. 17, before continuing on to six other cities in 2013. Japanese American veterans of the 100th Infantry Battalion, 442nd Regimental Combat Team and Military Intelligence Service came from 10 states to attend the opening. The program included a moment of silence for Sen. Daniel Inouye (D-Hawaii), who passed away last month. The World War II veteran and Medal of Honor recipient was represented by his wife, Irene Hirano Inouye. Both Inouye and one of his close friends, the late Sen. Ted Stevens (R-Alaska), were remembered for their support of men and women in uniform. Stevens was represented by his wife, Catherine. The keynote speaker, Secretary of Veterans Affairs Eric Shinseki, said, “New Orleans is the perfect place from which to launch this Congressional Gold Medal Tour. The National World War II Museum’s magnificent exhibits and this Congressional Gold Medal display come together in a very special way to tell a rich story about how, at a dark time in human history, American patriotism, American loyalty, American courage, honor, and determination … saved the world. The sacrifice was enormous for those who fought, and for their families. Shinseki recognized the Nisei veterans who were participating in the festivities: Nelson Akagi, Jimmy Doi, Michael Doi, George Fujimoto, Asa Hanamoto, Sus Ito, Jimmy Kanaya, Ray Murakami, George Morita, Lorry Nakatsu, Frank Nishimura, Tsutomu “Tommy” Okabayashi, Hitoshi Sameshima, Clarence Suzuki, Herbert Yanamura, Lawrence Yatsu, Ted Yenari and Tokuji Yoshihashi. Other dignitaries included Sen. Mary Landrieu (D-La. ); former California Gov. 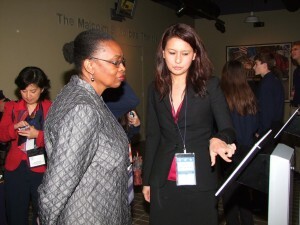 Pete Wilson, a board member of the National World War II Museum; Dr. Nick Mueller, president/CEO of the museum; Anna Cohn, director of Smithsonian Institution Traveling Exhibition Service (SITES); Claudine Brown, the Smithsonian’s assistant secretary of education and access; and Christine Sato-Yamazaki, chair of the National Veterans Network (NVN). The youngest speaker was Megan Madeira, Hawaii U.S. History Day Contest winner. Former CNN anchor Sachi Koto served as emcee. SITES has partnered with the Smithsonian’s National Museum of American History and the NVN, a coalition of Japanese American veteran and civic organizations representing eight regions in the U.S., to share the story of these men who fought with bravery and valor on the battlefields of Europe and the Pacific, even while many of their family members were held in internment camps back in the U.S. The medal is accompanied by an iPad application, social-learning website and curriculum available at cgm.si.edu. This educational package was developed by the National Veterans Network in partnership with the Smithsonian Asian Pacific American Center. Centered on the character values associated with Japanese American veterans — courage, respect, humility, perseverance, compassion and citizenship — these materials provide users with a constantly growing social-learning community. Presented to the three Nisei units on Nov. 2, 2011 in Washington, D.C., the medal represents Congress’ highest expression of national appreciation for distinguished achievements and contributions. A complete list of recipients is available at www.house.gov. After New Orleans, the tour will go to the Bernice Pauahi Bishop Museum in Honolulu, the Japanese American National Museum in Los Angeles, the De Young Museum in San Francisco, the Oregon History Museum in Portland, the Chicago History Museum in Chicago, and the Holocaust Museum in Houston. 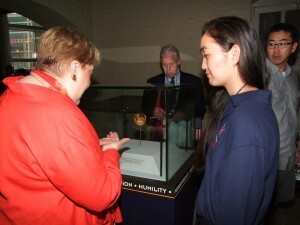 At the conclusion of the tour, the medal will be on permanent display in “The Price of Freedom” exhibition at the National Museum of American History in Washington, D.C.
“American Heroes: Japanese American World War II Nisei Soldiers and the Congressional Gold Medal” is made possible by the support of AARP, Cole Chemical, Comcast/NBC Universal, the Japanese American Veterans Association, Pritzker Military Library, the Shiratsuki family, and Southwest Airlines. 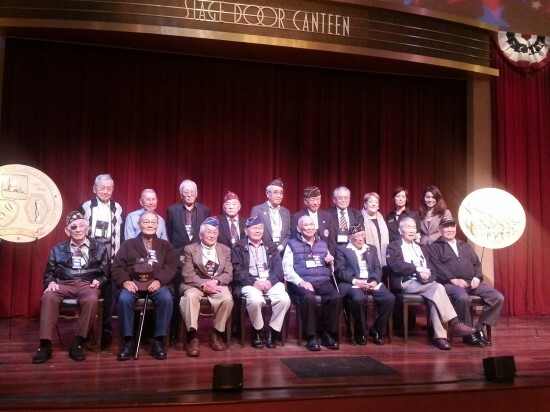 “Valor with Honor,” a documentary based on over 35 interviews of Nisei veterans, will be screened on Wednesday, Jan. 16, from 7 to 9 p.m. in the museum’s Stage Door Canteen. Director Burt Takeuchi will be on hand for Q&A. The event is free and open to the public. For reservations, call (504) 528-1944, ext. 229. • Irene Hirano-Inouye and Catherine Stevens — it’s good to see both of them again. I had a few minutes before coming in here to relay a little personal story about dealing with both of their men, and it was a humorous moment. It was a raising of the Army chief of staff by these two very senior senators; they put me through my paces. Sen. Inouye and Sen. Stevens were a legendary team, not just in the Senate, but in the Congress. I would dare say there have been very few relationships like this, maybe never, and I think we would be better if there were more of them. Not only was their relationship legendary, but what made it very special is that equally legendary was their support for men and women in uniform and for veterans. And I could always count, when I was serving as Army chief, that our budget would be about the first one out the door, and they made that as a matter of commitment to those of us who were serving. We miss them both deeply, and I think you understand why. • Christine Sato-Yamazaki — thank you for your leadership of the National Veterans Network [NVN] and for your extraordinary efforts to recognize our Nisei American soldiers. • Anna Cohn, thanks for the great support from you and Amy Hever and Claudine Brown, as well. Thanks for your insights, your expertise on these things that go along with putting together this meaningful display that educates, that reaches people who get to see it, and equally importantly, thanks for the sponsorship of the Smithsonian Institution in making this tour possible. And I know Conrad Ng would have wanted to be here today, so please convey to Conrad our thanks, as well. • Most importantly, the veterans of World War II, and your families who are here, and more specifically, as you’ve been identified, the men of the 100th Infantry Battalion, the 442nd Regimental Combat Team, and the Military Intelligence Service. One of the great virtues of this job that I have is the opportunity to take care of the people I went to war with in Vietnam, 40-plus years ago. I have the opportunity to take care of the youngsters that I sent on operation as serving Army chief. And I also have this tremendous privilege of taking care of the men who raised me. These are the men who went off to World War II and literally saved the world, and within my community, these legendary soldiers — the 100th, the 442nd, and the MIS. So for me this is a privilege you don’t often have in life, to be able to give back. And I’m honored to have this job; I’m privileged to have it, and I’m indebted to the president for giving me this opportunity. As I said, it’s great to be back in New Orleans. I can tell you for a fact that New Orleans is much more comfortable in January than it is in August, but I’m told the fishing is better in August, so you’ve got to make some choices. New Orleans is the perfect place from which to launch this Congressional Gold Medal Tour. The National World War II Museum’s magnificent exhibits and this Congressional Gold Medal display come together in a very special way to tell a rich story about how, at a dark time in human history, American patriotism, American loyalty, American courage, honor, and determination, as I said earlier, saved the world. The sacrifice was enormous for those who fought, and for their families. We all have a duty to educate future generations about what it took to preserve, for them, their birthright of freedom and liberty. If there is no value to those words, they’re only two words that show up in the dictionary. And what gives freedom and liberty value is when people like the men in this room stand up and do their duty, under the circumstances in which they did that duty. Only those who are willing to protect and defend this nation and our way of life can bestow such gifts, freedom and liberty, on anybody else. The shackled cannot. The free who are not willing to fight and defend it cannot. Only the free who are willing to fight can bequeath those gifts to others. And because they have, all of us in this room — my children, my grandchildren — have those gifts. They are free people. And today, in fulfilling this duty to educate through this national tour, our pride in this accomplishment is tempered just a little bit, so soon after the loss of a good and great American, Sen. Daniel K. Inouye. Like many other Nisei soldiers, Dan Inouye’s character and his destiny were shaped, fired, and tempered in the flames of what was known as World War II. Soldier, senator, statesman, but beneath it all, down deep, an American patriot of enormous resolve and principle, Dan Inouye’s extraordinary accomplishments are intimately tied to this Congressional Gold Medal that begins its tour this week. Most in this room know that when America was plunged into World War II, following the attack on Pearl Harbor, nowhere else was the impact of 7 December 1941 more keenly felt than amongst Americans of Japanese ancestry. Fear, suspicion, and, yes, even hatred prevailed. Most Japanese Americans were powerless to deflect the intense paranoia that followed. Many of them, because of their ethnicity, were declared category 4C, enemy aliens. And so Americans of Japanese ancestry appealed to our government for the right to bear arms and demonstrate their loyalty by defending this country in time of war, like other American citizens. And, to our country’s credit, their voices were heard, leading to the creation of these legendary units — the 100th, the 442nd, and the MIS — all-Nisei units led by Caucasian officers. Thousands of young Nisei joined up and rewrote the chapter on valor in our military history: 21 Medals of Honor; 52 Distinguished Service Crosses; 560 Silver Stars; and, over 4,000 Bronze Stars and a staggering 9,486 Purple Hearts. Equally staggering, seven Presidential Unit Citations were awarded to soldiers whose units averaged about 5,000 men any time during the period of their service, which only lasted probably 3 ½ years. There are regiments who are on service today that fought in the Revolutionary War, and they don’t have equivalent credentials. Where did we get such men? Where did these guys come from? They came from the dusty back roads in farm country, many of them from an agricultural background. They also came from the streets of towns and cities in mostly the western part of the country, and they came from the islands of Hawaii — I know we’ve got a Hawaii table out here. But they also came from the internment camps, where tens of thousands of persons of Japanese ancestry had been forced to relocate because they had Japanese surnames. Of the 21 recipients of the Medal of Honor, 10 fell in battle and 11 made it home safely. Sen. Dan Inouye was the 10th of these 11 surviving recipients to pass away recently. George Sakato is the last of the “Go For Broke” recipients of the Medal of Honor. He will be turning 92 next month. But these men would have been the first to say that there were many, many more heroes than 21 on the battlefields where they fought and won. And if he were here (at the luncheon), Ted Yenari — and to each and every other soldier in the 100th Infantry Battalion, each and every other soldier in the 442nd Regimental Combat Team, and each and every other Soldier in the MIS — living or deceased. This award went to each soldier who served in these units. Both Sen. Inouye and George Sakato proudly attended that ceremony in Washington, D.C. — and I know some other veterans in the room were there as well — a high honor that has only taken place 149 times in history of our country; 237 years and all the wars we’ve been in, the Congressional Gold Medal was presented only 149 times. This Congressional Gold Medal tour is about seeing, remembering, and understanding what this extraordinary group of men did almost 70 years ago. In all my 38 years in the military, I can find no better, no more compelling, and no more inspiring story of what it means to be an American than the stories and the battle histories of the men of these three legendary units. I don’t think the military will ever form units like them again, so their performance in battle is likely never to be repeated — and certainly, never to be outdone. These were not just good units; they were that, but much more. They were premier war-fighting units, ranking among the very best in our U.S. military history. The legacy of those who served in those units is a tradition of patriotism, of loyalty, of courage, of honor, determination, and sacrifice that’s as old as the American Revolution. Theirs is an American story. It’s not a story about three legendary units. It’s not a story about Americans of Japanese ancestry. This is an American story, and all of us have benefited from that; I know I, for one, have. I would not have had the opportunities I’ve had, had they not done what they did. So, capturing and preserving the details of this American story is an important and noble mission. Our children, our grandchildren, and their children, of all ethnic backgrounds, need to understand that whole communities of Americans of Japanese ancestry came under suspicion for circumstances not of their doing. They must understand that when Executive Order 9066 was signed by the president of the United States, nearly 71 years ago now, nearly 120,000 men, women, and children, more than 60 percent of them American citizens, were ordered from their homes and businesses and sent to “war relocation camps” — bleak, tar-paper and wood prisons, in desolate and remote locations in our country. They must also understand that these American citizens were strong enough to endure such profound injustice — with dignity. These Americans, who loved the nation as much as anyone else, complied with those orders, despite disbelief, disappointment, and shame. Our children need to know that some of these men then volunteered to fight for their country from the very camps where they had been imprisoned. In doing so, they helped remove all doubt about the loyalty and the citizenship of their families and their friends. And they need to know that any lingering suspicions were literally smashed by these quiet men, small in stature, who performed the most unbelievable acts of bravery, fighting with such determination that their units became among the most decorated in the history of the nation. • Came home and helped put America on a path to greatness by providing leadership in government, in business, education, religion, the sciences, and in so many other disciplines, growing our economy to the world’s largest before the end of the 20th century. • They were tolerant of views and politics different from their own, a faculty born of the intolerance some had suffered in the internment camps here and by what others had seen of concentration camps overseas. • And, they understood fully the privilege of American citizenship, the importance of fair play as part of our way of life, and the value of respect for our flag and for all who pledged allegiance to it. As Sen. Inouye once said of our country, only a “great nation” can admit its faults and rectify its mistakes, as the Congress and the president of the United States did in passing the 1988 Civil Liberties Act, apologizing on behalf of the American people for the evacuation and relocation of Japanese Americans during World War II. This Gold Medal tour will help ensure that future generations are strong enough to face challenge and endure hardship because they will have understood this American story and can see themselves in it. I am thrilled that this tour is about to be launched. I am one of the beneficiaries of the men in this room. I would never have had the opportunities I’ve had. And for all of us, of the younger generations, our responsibility is to ensure we’ve done our part to keep this story alive, and to make sure that what these gentlemen provided us with, this opportunity, doesn’t go to waste. It’s been an honor to be with you this afternoon. May God bless the young men and women who are serving today, much as the 100th, the “Go For Broke,” and the MIS did all those many years ago. God bless our veterans and God bless this wonderful country of ours. This is an excellent speech that captures the legacy of the Congressional Gold Medal recipients. discovered a real hero, a super human being and a refreshingly humble and determined man. We all miss him. .